The Brewer pitching staff returned to full strength Wednesday when Forest (sic) Pressnell returned to duty. His injured hand is all right again but he needs work to get into good pitching form. He was beaten Wednesday by Kansas City. The picture shows him throwing his knuckle ball. 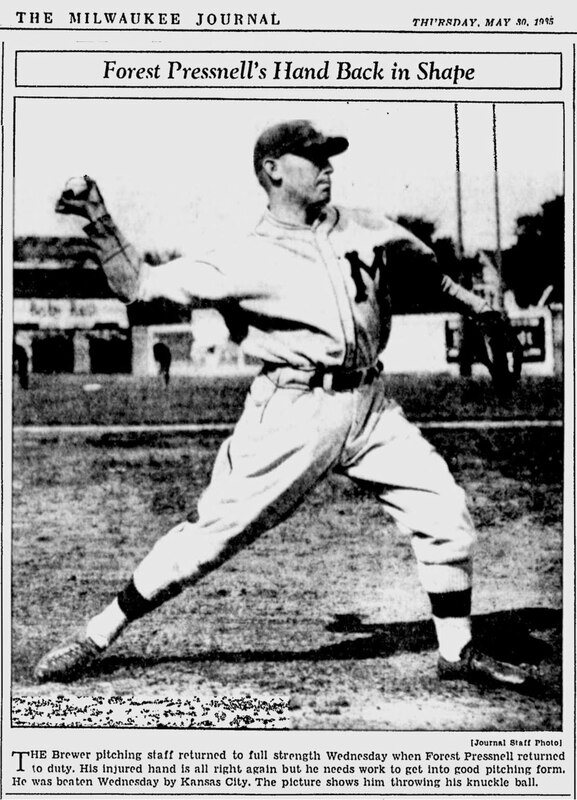 Pressnell came to the Brewers after the 1932 season from the Longview (Texas) Cannibals, a St. Louis Browns farm club. The Toledo News-Bee called him "one of the leading exponents of the knuckle ball among the younger generation of minor league pitchers." As with most knuckleballers of the times, he was accustomed to filling the dual roles of reliever and occassional starter. "I realize that clubowners are up against it in these times. But I am young and intend to stay in baseball for a long time. When conditions improve I know I will get more money." True or not, the reports would go a long way to establishing Tot as a fan favorite. 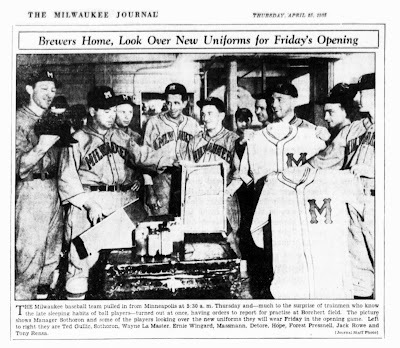 The 1933 season was a very forgettable one for Brewers fans, as the club limped to a 67-87 record, good for second-worst in the American Association. 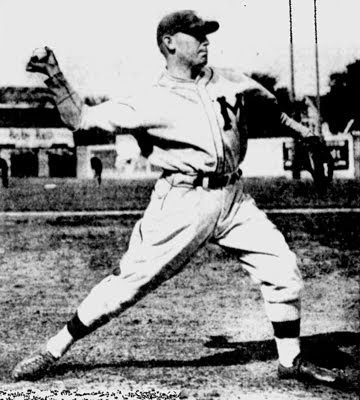 Pressnell himself struggled against the stronger opposition—ending 1933 with a 10-13 record and an ERA of 5.01—as the team tried to "improve" on the delivery of his knuckle ball. In August, manager Frank O'Rourke had enough, and instructed his young hurler to ignore all the advice. Pressnell tore through the final month of the season (scoring most of his ten victories in the last four weeks). This promise was enough to make him one of the few Brewers brought back in 1934, as most of the Brewer squad was sent packing, including O'Rourke. New Brewer skipper Al Sothoron was determined to learn from his predecesor's experience. "Since I came (to Milwaukee) I have listened to a lot of ballyhoo about Pressnell. Friends tell me the boy might have won more than 10 games last year if fewer people had interfered with his style earlier in the season. "A young pitcher can be ruined by having too many players telling him what to do. Pressnell's record for a first-year man in the A.A. is impressive." Sothoron did make one immediate change; he swapped Tot's ill-fitting "dime store glove" with a larger one better fitting his large left hand, in hopes it would preventing him from telegraphing his pitches. The new glove seemed to knock Tot off his stride, and Sothoron was forced to let him return to the familiar, if undersized, glove. Sothoron had more success adding an off-speed pitch to Pressnell's repertoire, and by the end of Spring Training Tot was quoted as saying he had "learned more about piching under Sothoron than (he) had since joining organized baseball several years ago." In addition, the Brewers brought veteran catcher George Susce from Detroit to handle the knuckleball, which Milwaukee fans had nicknamed the "dipsy-doo." With "Sweet Sue" as his backstop, Tot began to reward the Brewers for their faith. In addition to his starting appearances, Tot continued to pitch relief as well. He finished the season 15-11, and by the end of the season Sothoron's Brewers climbed to the middle of the American Association pack. The 1935 season was a tough one for Pressnell. 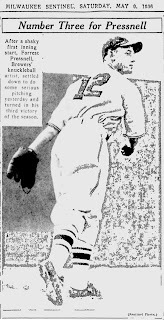 He missed most of May with a broken finger after being struck in the hand by a line drive off the bat of Toledo first baseman Bob Garbark, the injury mentioned in the first caption above. Susce was gone, released to the Mud Hens for starting fights with both teammates and fans. 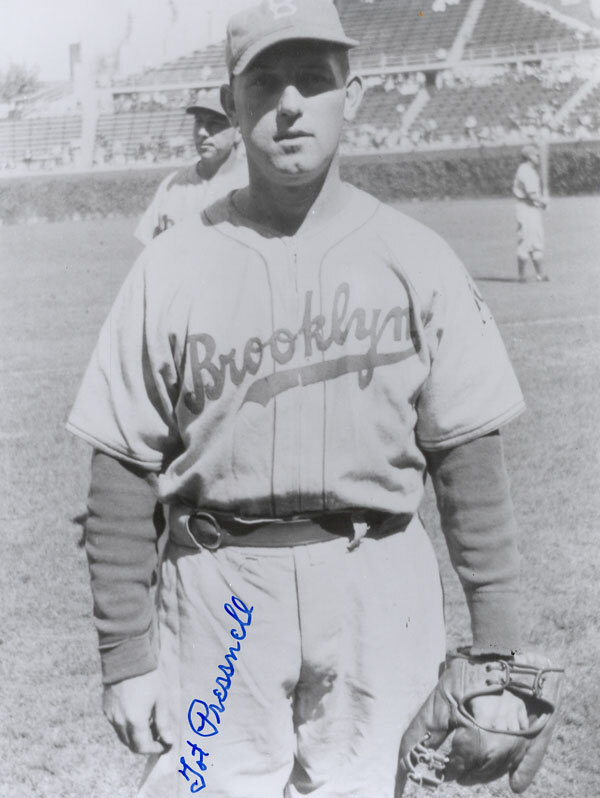 Pressnell was made a full-time starter in 1936, and his 19-9 record that season was an integral part of the Brewers' pennant-winning campaign. Tot also pitched well in the playoffs, starting the final game of the 1936 Little World Series, which the Brewers won 8-3 to clinch the Little Series for Milwaukee. Tuesday night will be Pressnell night at Borchert field, in honor of the Brewer mound ace, Forest (Tot) Pressnell. The picture gives some idea of his popularity. He stopped to autograph a program for a youngster and the third base stand above the clubhouse door broke out with a rash of youngsters with programs. Tot's popularity in Milwaukee, which had started with his very first contract, continued to grow. He was the rare minor-league superstar who wasn't publicly angling for either more money or a big-league contract. Tot was biding his time, perfecting his craft in the American Association, while waiting for an opportunity to prove himself against the best in the Bigs. 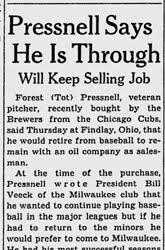 Pressnell went 18-12 in 1937, when it was becoming increasingly clear to the Brewers and their fans that Tot would soon get that opportunity. "All Tot needs is a chance," Sotheron told the Sporting News. "He deserved promotion last year, but the scouts lacked the courage to recommend his purchase." Brewer fans, for their part, were happy to keep him at Borchert Field. The club held a "Forrest Pressnell Night" on Tuesday, August 10, 1937. Before the game, which the Brewers won 6-2 on the strength of Presnell's 15th victory of the season, Tot was given a golf bag by his teammates. The fans presented him with a new car, an extremely generous gesture even if they reportedly traded in his old one to pay for it. In 1938, Pressnell was finally rewarded for his years of hard work. The Brooklyn Dodgers brought Tot and fellow pitchers Whitlow Wyatt and Luke Hamlin from Borchert to Ebbets Field, where Pressnell quickly established himself as the Dodgers' number-one starter. Tot's arrival in Brooklyn was overshadowed by another new face in the Bums' dugout; coaching on the first-base line that year was a baseball legend named George Herman Ruth. Two years removed from his days in the field, and already a charter member of baseball's Hall of Fame, the Sultan of Swat was trying to kick-start a managerial career. Alas for the Babe, it was not to be. As the season went on, it became clear that the Dodgers always viewed him more as a quick box-office boost than a potential manager. They were happy to charge the crowds to watch their base coach take batting practice (and even play in exhibition games), but when a managerial vacancy came up at the end of the season, the Dodgers hired Leo Durocher. A diappointed and disillusioned Bambino left baseball for good, giving away his baseball equipment to the younger players he had hoped to lead. Pressnell ended up with Babe Ruth's glove, a keepsake Tot treasured for the rest of his life. In 1940, the Dodgers acquired Milwaukee's Tex Carleton and Newt Kimball. With five former Brewers on his pitching staff, Brooklyn president Larry MacPhail boasted that the Dodgers had "the pitchers who made Milwaukee famous." Having finally made it to the Majors, Tot went for the money he had known wasn't to come from the Brewers. 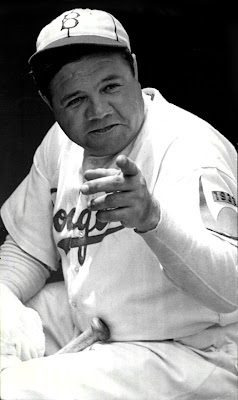 He returned his contracts to the Dodgers unsigned, twice in 1939 and another four times in 1940, holding out each season. Perhaps the holdouts soured Dodger management on Pressnell. Perhaps Tot's absence from Spring Training allowed other pitchers to make their case for his spot in the rotation. 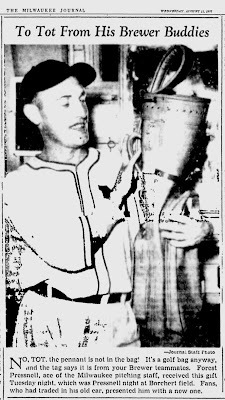 Whatever the case, in 1940 Pressnell found his playing time limited in favor of another knuckleballer, Freddie Fitzsimmons. In August, Tot was optioned back to the American Association, this time to the Dodgers' farm team in Louisville. He was there long enough to garner a 6-4 record before returning to the Dodgers in late September. The 1940 off-season was a tough one, as the Dodgers sold him to the St. Louis Cardinals, who took less than a month to decide that they didn't have a spot for him. The Cards sold him to the Cincinnati Reds, who on February 4, 1941 sold his contract to the Chicago Cubs. 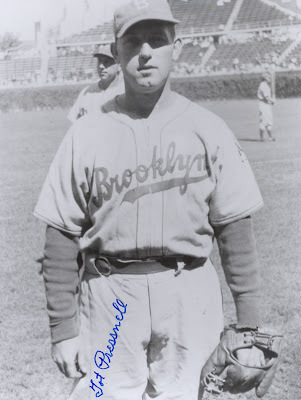 Pressnell played for two seasons on Chicago's north side to close out his Major League career, coming in as a reliever in 56 games. 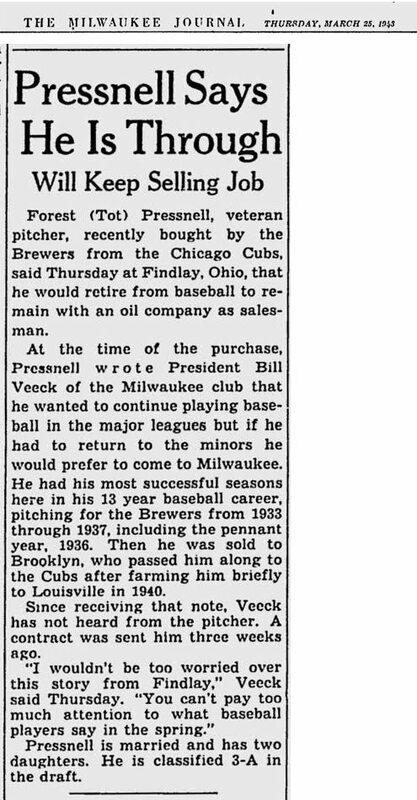 In 1943, new Brewers president and owner Bill Veeck bought his contract from the club and offered Pressnell a chance to return to the Orchard. Tot had hoped to stay in the Majors, but told Veeck that if was to play in the minors at all, it would be Milwaukee. Unfortunately, there was to be no hero's return for Forrest Pressnell. Before agreeing to terms with Veeck he decided that, at 35, he'd had enough of minor league baseball. He elected to remain at his off-season job as a salesman with an oil company and retired from the game. Wish I could have met Tot. I got to know his daughter in Findlay, Ohio via email and I know that Tot continued to develop his signature after he retired from baseball because he was so conscientious about how his autograph was perceived by the public. He had to have been a household word during his years in Milwaukee! I knew Uncle Tot very well. He showed us neighborhood kids how to throw a knuckle ball. He is in a bunch of my family pictures on my website http://pressnellreunion.com/ The front page top picture has my Grandpa on the right with his hands on Uncle Tots shoulder. All the Pressnell's are there with their mom on the left, minus their dad. 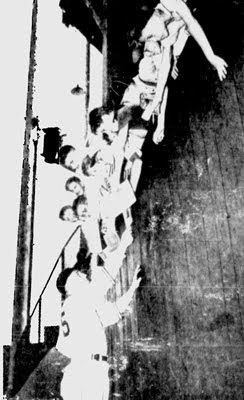 Their dad, Hardin T Pressnell, is in the picture below "left" on an "Old Dutch" wagon.